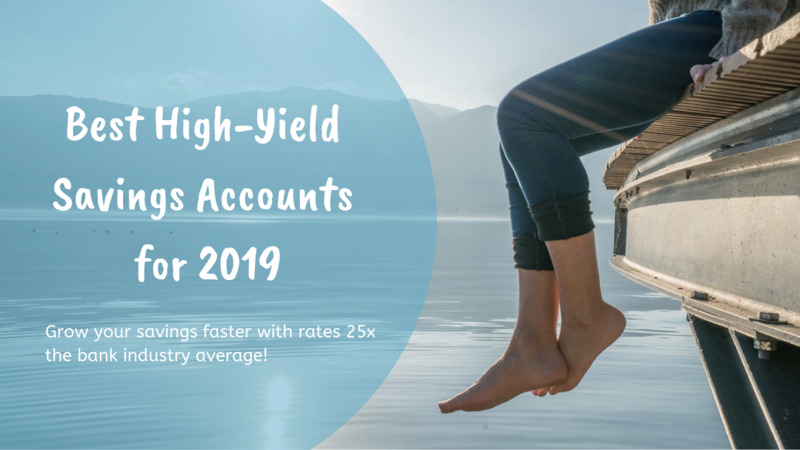 Many banks compete for your business but the best high-yield savings accounts for 2019 remain at online banks. Online banks don’t have to worry about the costs of maintaining branch locations and paying salaries to staff at multiple locations. Due to less overhead, online banks can pass their savings onto you in the form of high-yield savings accounts. Big banks like Chase pay a measly 0.01% APY. According to the Federal Deposit Insurance Corporation. the national average savings rate is currently 0.09% APY. Online banks are currently paying up to 200 times more yearly interest (or what’s called APY: annual percentage yield) than a physical bank. This means if you placed $10,000 in savings at Chase paying .01% APY you’d earn $1 in interest, but a bank offering 2.45% like CIT Bank would earn you $245 in interest over the year. Online high-yield savings accounts typically offer the best place to save your money. If you’re growing tired of the slow growth and low interest rates of your traditional savings account, you might consider moving your funds into a high-yield savings account. This kind of account can help you reach your savings goals faster. Take a look at our picks for the best high-yield savings accounts to determine which product works best for your financial situation. With an APY of 2.35 percent, VIO Bank, the online division of MidFirst Bank, offers one of the most competitive interest rates, and it only requires a minimum deposit of $100 to open an account. What’s more, VIO charges no monthly fee and allows users six free monthly withdrawals. Requirement to earn 2.35 percent: None. Consistent investing in a savings account over a long period of time can be an effective strategy to accumulate wealth. Even small deposits to a high-yield savings account can add up over time. Start your snowball now by earning compound interest in a high-yield savings account today. You’ll never regret it. Saving money can take time to yield decent returns but it’s one of the safest ways to grow your money. There are more effective ways to build wealth, however your money will not be as liquid as a savings account. A certificate of deposit, or CD can help you meet savings goals. CDs are a long-term savings instrument that have a fixed interest rate and fixed date of withdrawal. CDs are issued by banks and insured by the FDIC up to $250,000 per depositor. You can expect a higher rate but cashing out before the fixed date of withdrawal (maturity date) can cost you. The only way to get past the penalty of early withdrawal is with a No-Penalty Certificate of Deposit. 1. TIAA Bank’s 2.95%, three-year CD offers one of the highest CD Rates. BBVA Compass Bank’s 2.25% three-year CD offers a competitive rate and only requires $500 to open. CIT Bank’s 2.05% 11-month No-Penalty CD offers one of the highest CD Rates for a short-term CD. Plus you can withdraw your money with no penalty. Penalties can be substantial so this is a good deal. Popular Direct’s 3.05% two year CD offers one of the highest CD Rates but you must deposit a minimum of $10,000. Sallie Mae Bank’s 3.00% two-year CD offers a great CD rate. Sallie Mae is not just for student loan borrowing.